Friends and fellow SEOs, I just need a few minutes of your time. This is gonna be short and sweet. If you're optimizing a page to rank well for a keyword or set of keywords, you probably use some sort of checklist to make sure you're doing the right things. That might be through an SEO plug-in like Yoast or through Moz Pro's On-Page Grader, or it might be just be a mental checklist. The problem is, there's a crucial set of flaws in how I've seen a lot of marketers and SEOs approaching on-page SEO in the last few months, and I want to help. These five mistakes and biases are popping up too often in our field, so let's address each with simple, tactical fixes. I know. Many tools, free and paid, check for how many times a keyword is used on a page and in certain elements (like alt attributes of images or meta description tags or in bold text). The SEO software world's on-page suggestions, Moz's included, are far behind Google sophistication in this sense, but you don't have to be. Use tools' simple rules and checks to make sure you're meeting the minimum bar, but don't fall for advice like "1 use of the keyword phrase every 100 words" or "at least 4 uses of the keyword in HTML text." The MozBar's on-page suggestions are pretty good for this (though even it has some flaws, e.g. 75-character URL limits strikes me as too short), and don't get bogged down in much X number of repetitions malarky. Remember that Google cares a lot about how visitors interact with your content. If searchers don't click on your listing, or do, but bounce back to the SERP because you're not delivering the content or experience they want, you'll soon be off page one (see Brafton's excellent, recent case study on this). Bottom line: Yes, it's still wise to use the keyword that searchers type into Google in your title, your description, and on the page. But repetition-based rules are not gonna boost your rankings, and may inhibit your usability and content quality, which have far greater impacts. Serve the goals of the searcher. Deliver the experience they need and the answers they want. This is vastly more important than any simplistic keyword use rule. 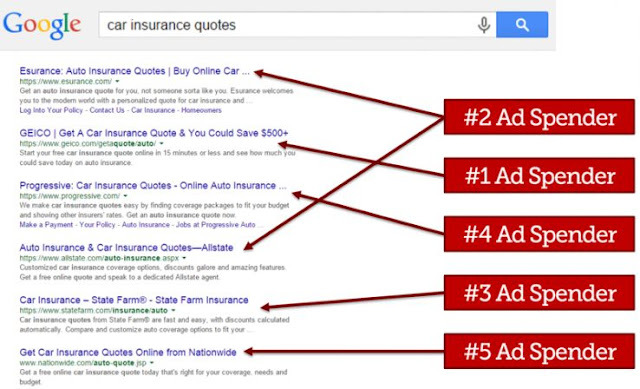 Want a quick and easy way to figure out what searchers are seeking around a broad keyword? Do some basic keyword research! E.g. I popped "faberge eggs" into Keyword Explorer, looked at the suggestions list, chose the "are questions" filter, and BOOM. KWE is giving me insight into exactly what people want to know about the eggs: What are they? How do you make them? How much do they cost? How many were made? Who was Faberge? You don't have to use KWE for this; most keyword research tools — even free ones like Ubersuggest or AdWords — will get you there. The goal is to understand what searchers want, and deliver it to them. For example, there are a lot of image searches for Faberge Eggs, suggesting that photos are critical to delivering the right user experience. The many questions and searches related to price and construction suggest that some folks want their own and, thus, providing links or information about how to craft replicas or where to buy them probably makes great sense, too. In my experience, it's vastly easier to create content of any kind that serves your visitors first, then retrofit that content with keyword rules vs. the other way around. I get deeply worried when I see marketers or content creators putting the cart before the horse and focusing on keyword use as though some precise placement will incite Google to rank you ahead of all those content pieces that satisfy and delight their searchers. Bottom line: Discover what searchers want and deliver it to them before you worry about keyword use or repetition in your content. Raw keyword repetitions and simplistic rules don't take you far in 2017, but... related topics absolutely do. Google wants to see documents that intelligently use words and phrases that connect — semantically, lexically, and logically — to the queries searchers are using. Those topics help tell Google's on-page quality analysis systems that your content A) is on-topic and relevant, B) includes critical answers to searchers' questions, and C) has credible, accurate information. Check out that badass featured snippet. It's not the #1 ranked page. And strangely enough, it's the page with the fewest links and linking root domains on page one of Google's SERPs. 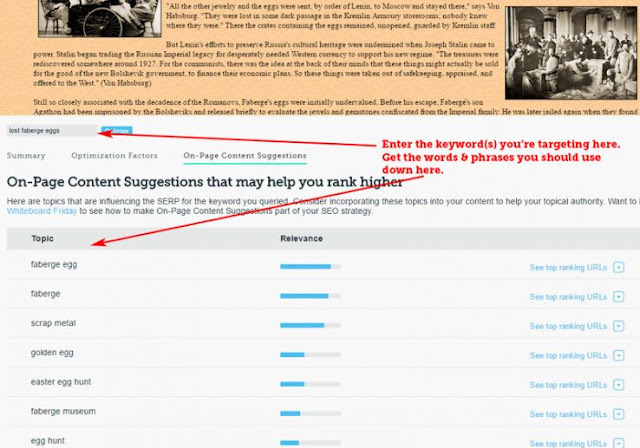 But it NAILS the content optimization, providing the right answers in the right format for both Google and searchers. Seriously, that's the competition — 9 sites you've definitely heard of, whose media brands and domain authority would make you think a come-from-nowhere underdog wouldn't stand a chance in these SERPs. And yet, there it is, like a beautiful Cinderella story dominating page one. Want to replicate this success? It's not that hard. I believe there are a few other tools that provide this functionality, including the Italian SEO Suite, SEOZoom. 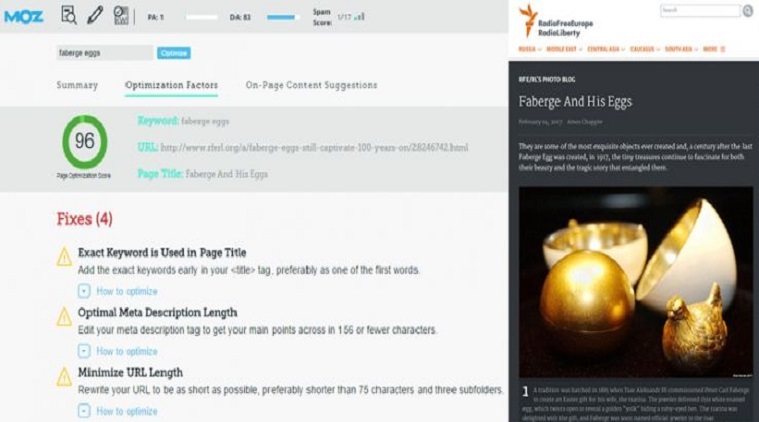 The MozBar gets its suggestions by crawling the pages that rank for the keyword, extracting out unique terms and phrases that appear on those pages more frequently than in other content across the web, and then listing them in order of relative importance/value. It makes sense that words like "Peter Carl Faberge," "Tsar," "Imperial Easter Egg," and "Faberge Museum" would all belong on any content targeting this search query. If you're missing those terms and trying to rank, you're in for a much more difficult slog than if you employ them. Step two: If there's any chance for a featured snippet in the SERP, aim for it by optimizing the format of your content. That could mean a list or a short explanatory paragraph. It might mean a single sentence atop the page that gives the quick-and-dirty answer while beckoning a searcher to click and learn more. Dr. Pete's guide to ranking #0 with featured snippets will give you more depth on how to get this right. Bottom line: There are keywords beyond synonyms or raw repetitions that can help you rank and claim the featured snippet position. You can find them manually or with tools, and employ them in your content to dramatically boost on-page SEO. This one's dead simple. We need to change our biased thinking about links and content from the days of 2012. Back then, it was still the case that a few more links with anchor text would move even an irrelevant, low-quality page of content above better and more valuable pages. 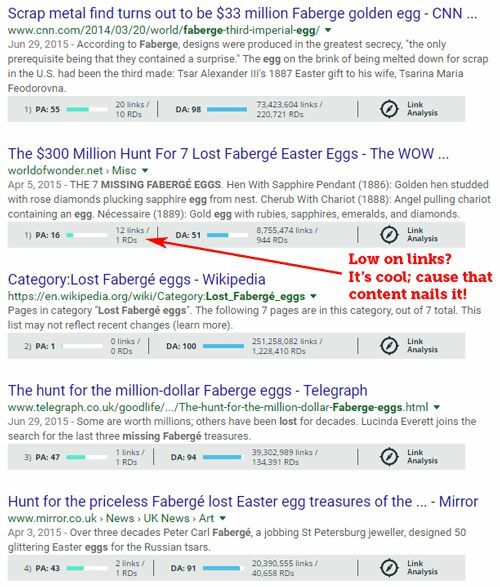 Today, it's vastly more likely that very-well-linked-to pages (as in the example above) are getting their butts handed to them by marketers who go above and beyond with their on-page SEO efforts, winning despite a link deficit because they deliver the content and the experience Google (and searchers) want. Bottom line: If you're ranking on page 2 or 3, blunt-force link building shouldn't be the only tool in your wheelhouse. Modern on-page SEO that better serves searchers and more intelligently considers content formatting and word usage and searcher satisfaction has got to be part of the equation. In 2012, Wikipedia and big sites like them dominated many results simply by virtue of their raw link authority and importance. Today, domain authority still plays a role, but it's not just link equity or the size and popularity of the site that matters. There's an element of topical authority and expertise in Google's algorithm that can deliver dramatic results to those willing to lean into it. For example, in the SEO field, Moz has topical authority thanks to our years of writing about the subject, earning links from the field, becoming associated with the subject, and the close semantic connection that the words "Moz" and "SEO" have all over the web. The entity *Moz* surely lives in some Google database with a close word-association to SEO, just as SeriousEats lives alongside recipes, Dribbble lives alongside design, Zappos lives alongside shoes, and Zillow lives alongside real estate. In many cases, it's not just about optimizing a page for a keyword, or earning links to that page, but about what your brand means to people and how the entity of your brand or organization might be associated with topics and topical authority in Google's eyes. This means that "on-page optimization" sometimes extends to "on-site optimization" and even "off-site brand building." If Moz wanted to start ranking well for keywords far outside its current areas of thought leadership and topical relevance, we'd likely need to do far more than just go through the on-page SEO checklist and get some anchor text links. We'd need to create associations between our site and that content space, and indicate to Google and to searchers that they could trust us on those topics. If you're working on ranking for sets of keywords around a subject area and struggling to make progress despite nailing those two, topical authority may be to blame. How do you build up authority around a topic? You associate your brand with it through online and offline campaigns. You publish content about it. You earn links from sites that talk about it. Your brand name gets searched for by people seeking it. You develop a following from the influencers around it. You become synonymous with it. There are thousands of tactics to pursue, and every organization is going to do best with the tactics that work for their audience, play to their strengths, and enable them to uniquely stand out. Just make sure you figure this into your calculus when considering why you may not be ranking, and what you may need to do differently. Bottom line: Websites earn associations and connections with subject matter areas in Google. To earn rankings, you may need to address your entire site's brand focus, not just an individual page's keyword targeting. Facing QuickBooks Error code 3371? Call now our QuickBooks Support Number 888-677-5770 and our experts will fix your issues instantly. Our professionals will assist you to resolve this issue. You can avail our services 24x7 from our accounting experts. we have been offering our QuickBooks Support services across different business verticals. We help our users with the accounting services that include accounting, consulting, data conversion, file review, hosting, integration, implementation, maintaining reports, etc. The major issues that users face with their accounting software include installation & re-installing issues, unable to access data files, printing error, PDF error, damaged data file, unable to update, and a lot more. Thanks for sharing this blog. This is the kind of information I was looking for. This is really helpful and to the point and there is no unnecessary story telly.